Piulachs, X.; Serrat, C.; Rué, M.; Armero, C.; Forte, A.; Perpiñán, H.; Luján, M.; Páez, Á.
Prostate specific antigen (PSA) is a biomarker for prostate cancer (PCa) that is widely used for PCa screening. 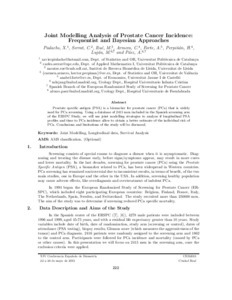 Using a database of 2415 men included in the Spanish screening arm of the ERSPC Study, we will use joint modelling strategies to analyze if longitudinal PSA profiles and time to PCa incidence allow to obtain a better estimate of the individual risk of PCa. Conclusions and limitations of the study will be discussed. Piulachs, X. [et al.]. Joint modelling analysis of prostate cancer incidence: frequentist and bayesian approaches. A: Conferencia Española de Biometría. "XIV Conferencia Española de Biometría, Ciudad Real 22-24 Mayo 2013". Ciudad Real: 2013, p. 222-225.